It's time to take a closer look at the linear stages I will be using. I'd love to do a full teardown, but unfortunately that isn't practical. Proper reassembly requires careful alignment, and I do not want to risk ruining stages I plan to use. Luckily we can get at most of the interesting parts. For the X and Y axes I am using a pair of Parker MX80L-T04 stages. These stages are ideal for extremely fast and precise positioning of small loads, which is well aligned to the requirements of 3d printing. 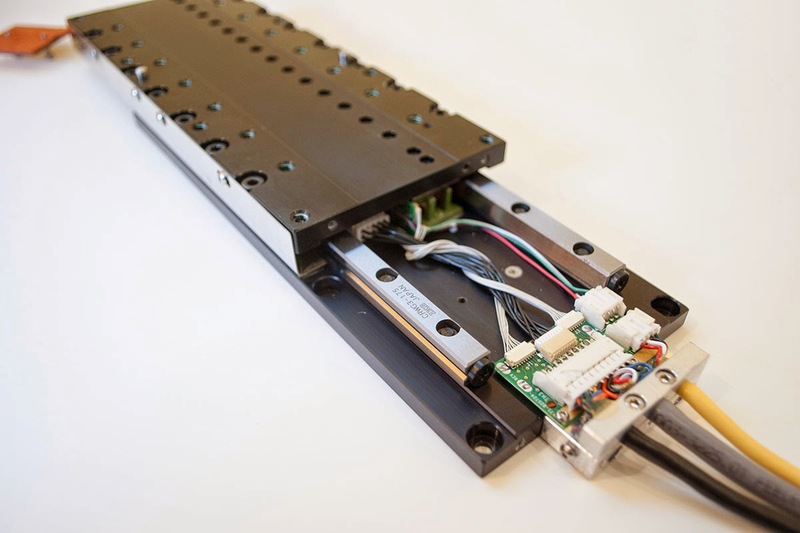 The first thing you will notice is that commercial linear stages have a lot of mounting holes. For our application it is safe to assume every surface is flat and square to the direction of travel. This provides a lot of options for attaching the stages together, and makes alignment very easy. At the front of the stage there is a yellow clip which prevents movement during transport. 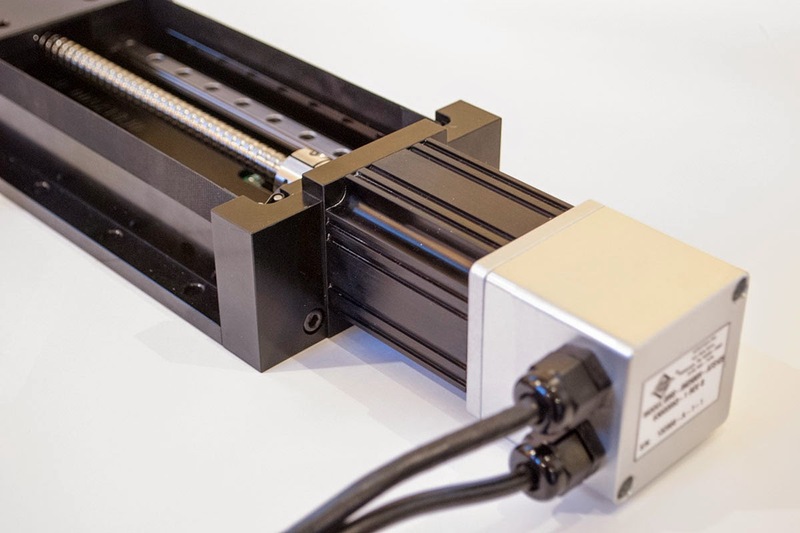 A linear motor provides no resistance to motion when unpowered, and can be damaged if not locked in place. Before we take a look inside, here is a page from Parker's flyer which outlines the basic layout of this stage. Parker went to some pretty extreme lengths to fit everything into a 80mm x 25mm cross section. It already looks crowded in the drawing, and it is even more tightly packed in reality. 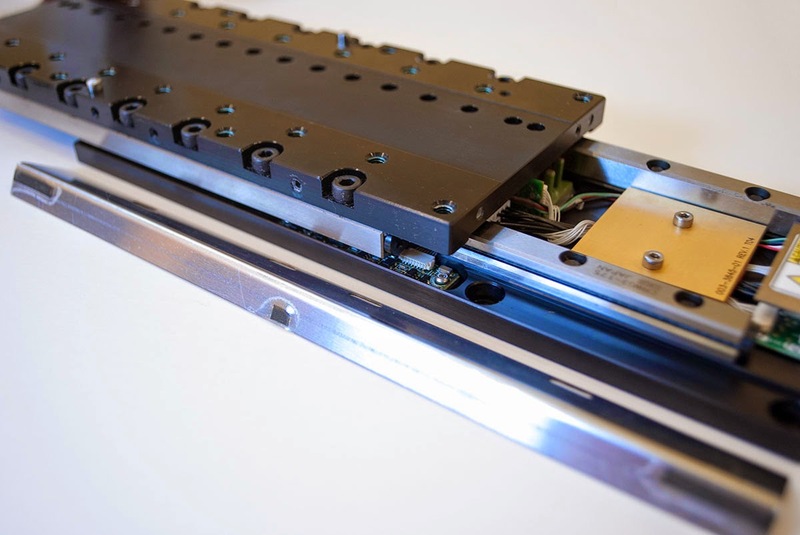 The linear motion is provided by an anti-creep cross roller slide. If you look closely into the groove you will see a ribbed pattern. There is actually a tiny gear that rides in the slot to keep the rollers centered. Both the fixed and moving portion of the linear stage have a full length rail to accommodate the non-recirculating bearing. A non-recirculating bearing creates less vibration than a standard bearing, but in return has shorter travel. A roller bearing also uses cylinders instead of balls. The increased line contact verses the point contact of a ball allows higher loading, rigidity, and accuracy. Although we cannot disassemble this stage, it turns out we don't have to! The internals are completely revealed just by sliding the stage to the limits of its travel. We can get a glimpse of the encoder reader and motor stator, but what really jumps out is the sheer number of wires in this stage. 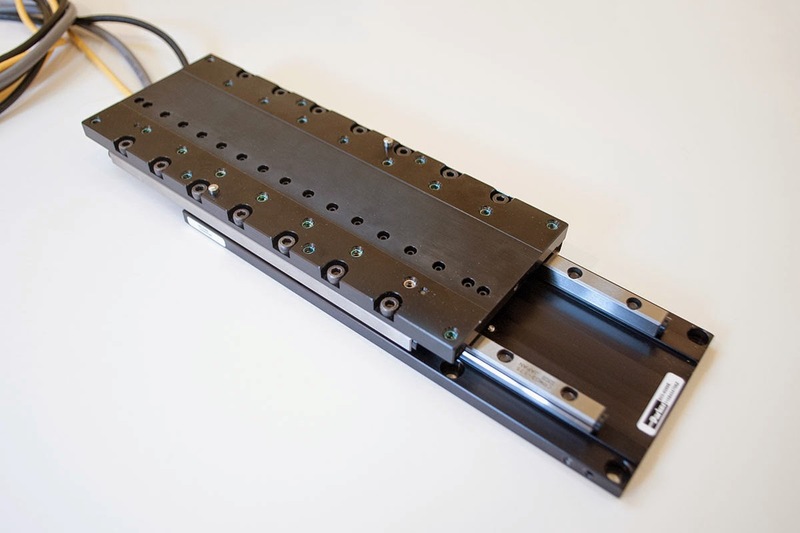 One common feature of linear stages is that they come fully equipped with limit, homing, temperature, and commutation sensors, along with differential encoder outputs and the servo power wiring. The gold plate which was covering the wires appears to be a featureless PCB used to hold the loose wires in place so they cannot catch on moving components. If we flip the stage upside down we get to see the encoder strip. As far as I can tell, the encoder is a Renishaw RF2 series analogue system that is interpolated down to 10nm. The scale has a 20 micron pitch which is our glimmer of hope for converting it to a more sensible resolution. The magnets are also visible from this angle. 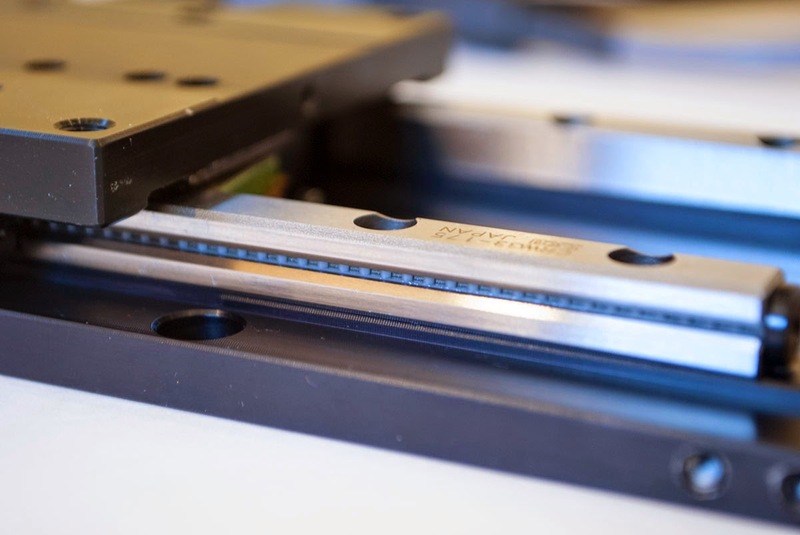 One of the reasons why linear motors frequently use cross roller bearings is to resist the massive force these magnets create. 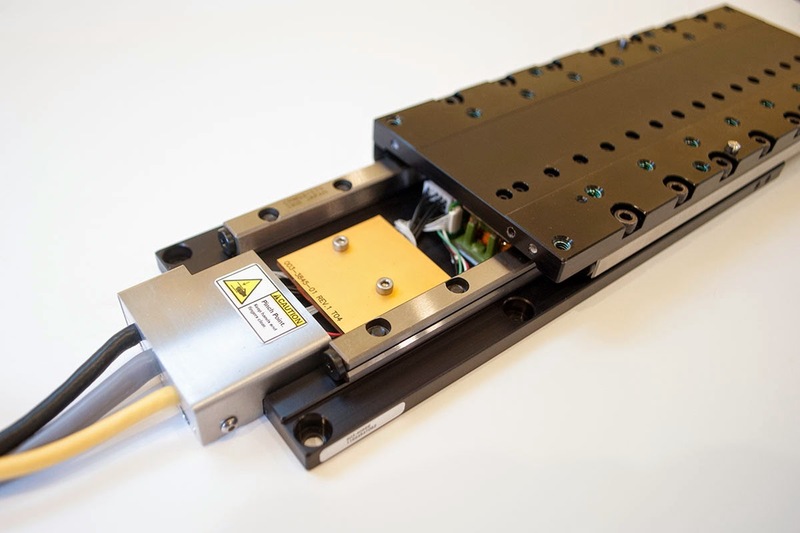 The attraction between the two halves of a linear motor can be as much as 10 times their continuous force rating. Even under such a heavy load, the cross roller bearing is completely smooth and frictionless. So far we haven't unscrewed a single fastener, but four screws must be removed for a peek at the limit switches. A small PCB containing the sensors is embedded into the stage. The magnets which activate the limits are taped to a small guard for easy adjustment. As I'm not willing to disassemble the bearings, this is as far as we can go with the MX80L. Overall the construction is extremely impressive and there has clearly been careful attention to detail in its design. 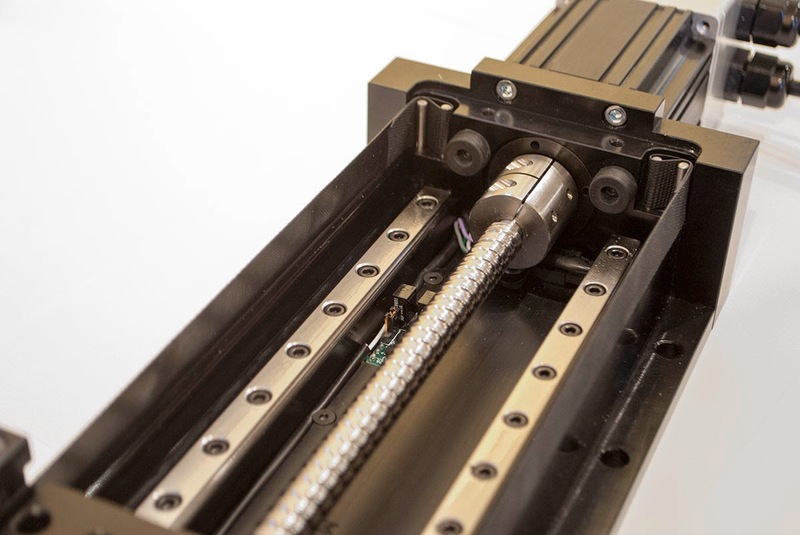 The linear motor allows for incredible performance in a small form factor, and the cross roller bearings provide accuracy to match. 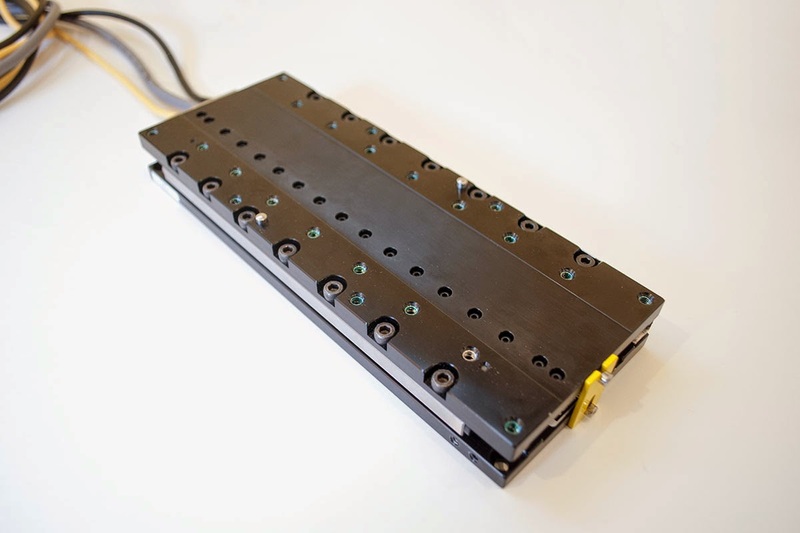 Although a linear motor stage has many advantages, they aren't ideal in the vertical orientation. 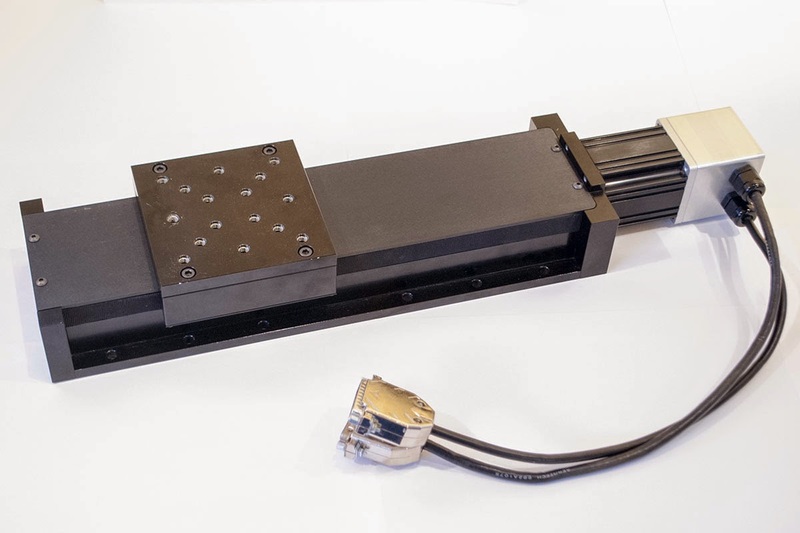 A linear motor provides almost no resistance to motion when unpowered, so the Z axis will simply fall to the ground. This can be overcome by counterbalancing the load with springs or pneumatics, but I chose to sidestep the issue entirely. A printer Z axis has no need for the performance of an MX80L stage, so instead I will use a more conventional Aerotech ATS125. Although I describe the ATS125 as conventional, it is actuated by a servo driven ballscrew and has comparable mechanical accuracy to the MX80L. Naturally it cannot compete in speed or acceleration, but it still boasts impressive numbers. Lets take a closer look because there are actually some neat choices inside. The first thing you will notice about this stage is that its internals are completely sealed behind a dust shield. The sides are protected by a rather novel rubber belt system that moves around the table. Pop it open and we get to see the ballscrew and linear rail. This is exactly the layout you expect from a ballscrew driven stage. Two sets of recirculating bearings provide the linear motion, and a highly precise ground ballscrew ensures accurate positioning. With the cover off, we also get a closer look at the dust seal. You can see a spring-loaded rubber belt that is routed around the table by a set of rollers. Just like the MX80L we are given a full set of limit switches, and a Z encoder pulse for accurate homing. Although the layout of this stage looks conventional, upon closer inspection there is something odd about the design. The motor looks separate, but it is actually part of the stage itself. Furthermore, the ballscrew is only supported on one side and is directly coupled to the motor shaft. 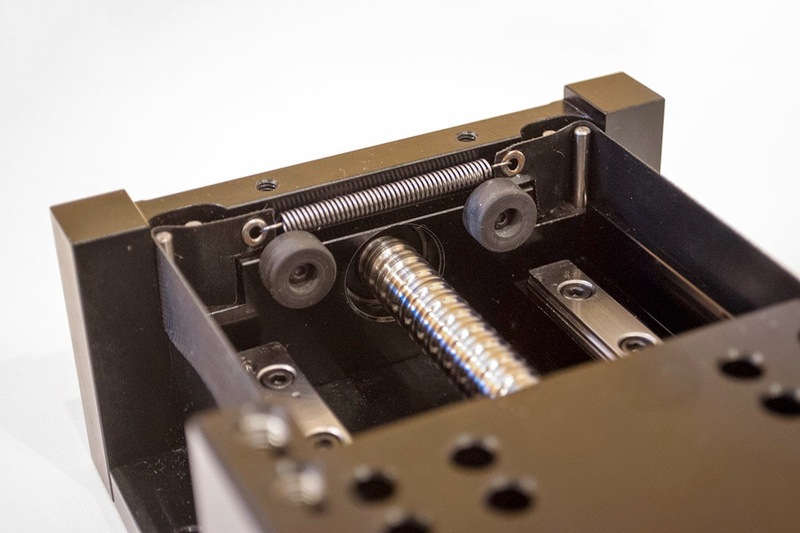 If you familiar with ballscrew mounting strategies, this makes no sense - there is no fixed end! 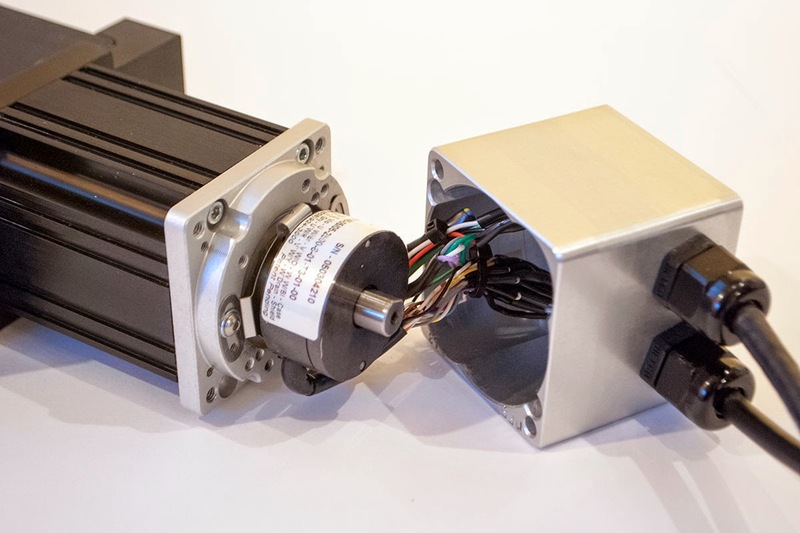 Aerotech actually placed the angular bearing pair on the motor shaft, and uses a rigid coupler to fix the ballscrew in place in what they refer to as the "integral motor option". This choice has a few implications: It allows a shorter design as the motor is partially integrated with the stage. 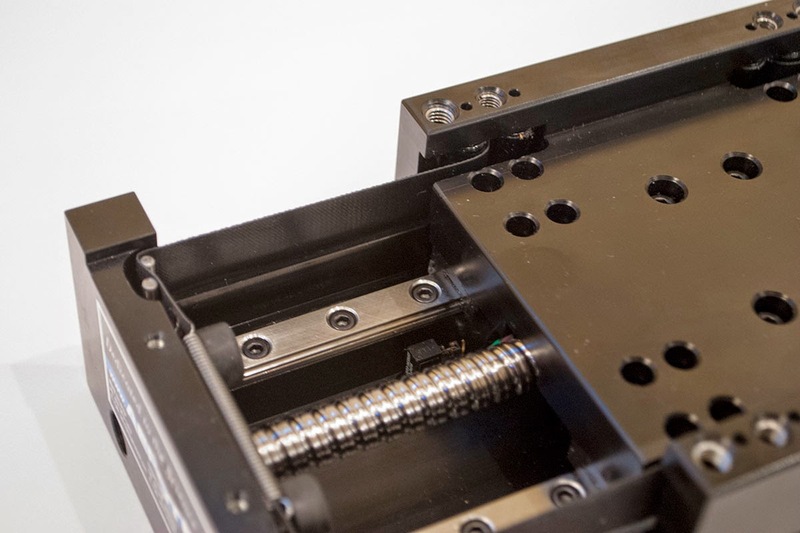 As well, the rigid connection between the motor and the ballscrew avoids the slop of a more forgiving coupler. The downside is that it becomes very challenging to replace the motor. Finally we can pop the cover off the servo and see the encoder and wiring. It is pretty clean inside, and some wires are even helpfully labelled. The electrical configuration of this servo is almost identical to that of the Parker MX80L. If you are used to stepper motors you might have noticed that these stages have a lot of wires. This is really the hardest part of using servos. If you buy a matched system it can be plug and play, but trying to mix and match different components is more hit or miss. Comprehensive datasheets are provided so you can generally figure out how compatible parts will be before purchase, but the manuals can be quite technical. The Parker stage uses two HD15 D-Sub connectors for the encoder and limit sensors respectively. I haven't been able to identify the 5 pin connector they use for power, perhaps its a DIN? 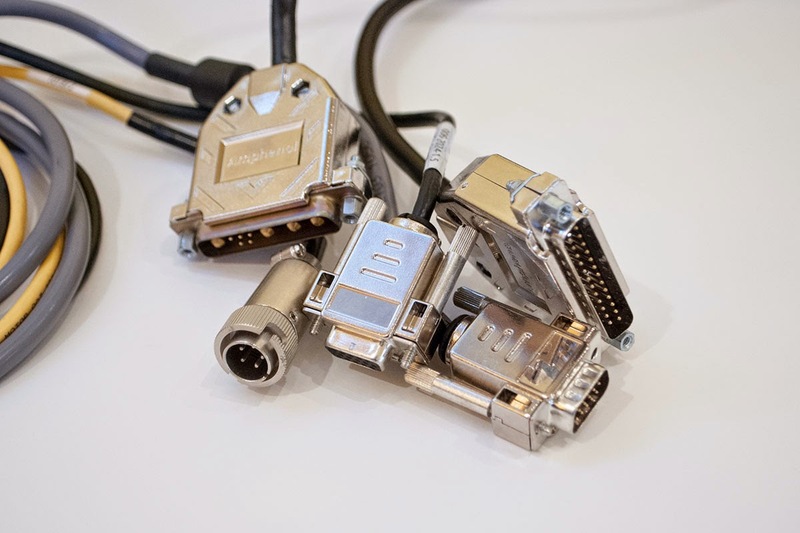 The Aerotech stage uses a single DB25 connector for both the limits and encoder, and uses the four power pins of a 9W4 D-Sub connector for the motor. 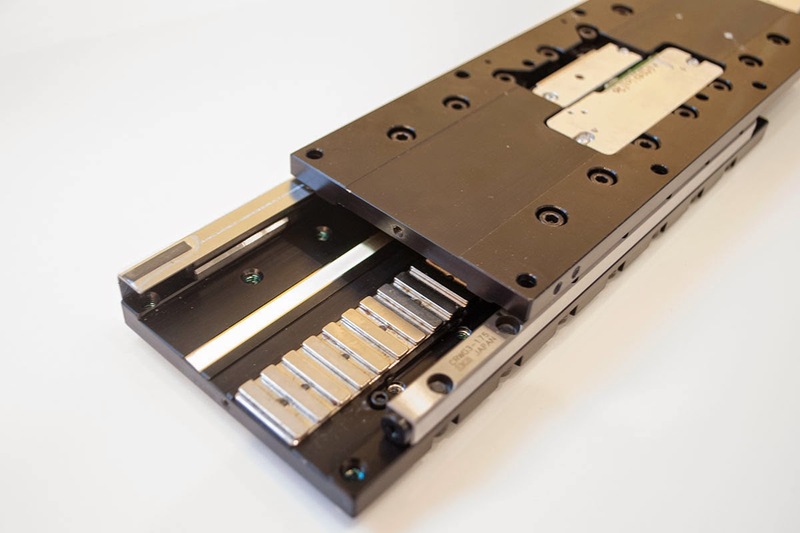 This concludes our look inside the Parker MX80L and Aerotech ATS125 linear stages. I think you will agree they are very impressive components capable of dramatically outperforming anything a hobbyist could assemble. Next up I'll be testing the stages. Here's hoping everything works!